Der T-127 ist ein sowjetischer premium leichter Panzer der Stufe 3. Das Fahrzeug wurde zusammen mit dem T-126 im Werk Nr. 174 Frühling bis Herbst 1940 entwickelt. Die Entwicklung wurde in einer frühen Phase abgebrochen und aufgrund von Problemen mit dem V-3-Dieselmotor nicht wieder aufgenommen. 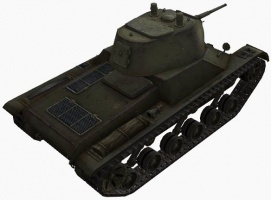 The T-127 offers some of the thickest hull and turret armor of its tier. The frontal armor is slightly sloped to encourage ricochets. Avoid exposing the rear of the turret as it is the weakest section of armor. The T-127 uses a gun that can penetrate most equivalently tiered tanks and offers a good rate of fire. 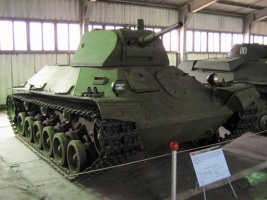 While it is slower than the other Soviet light tanks this tank is much more at home on the front lines than its faster and more agile siblings. 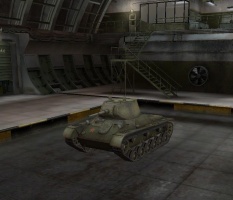 Like many other premium tanks the T-127 must change its role to a support tank in a match made up of higher tier tanks. 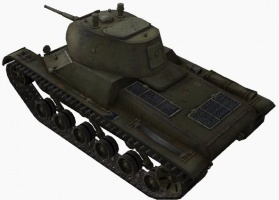 The T-127 is a heavier tank than its brethren, the BT-7 and the T-46, and as such trades some agility and speed for increased armor and slightly improved armament. This makes the T-127 more of a frontline tank rather than a true scout. 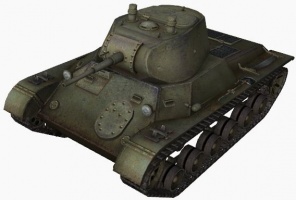 Indeed, the sloped armor will allow you to bounce a lot of shots from other tanks of the same tier, and take multiple hits without much trouble. Don't fear autocannon and machinegun equiped tanks you'll face, as they will simply bounce off your frontal hull and rarely ever penetrate, just keep your cool and shrug off their fireworks. If you use cover and time your shots, you can take on multiple opponents and last very long in close combat. For this reason, the T-127 works quite well in city maps such as Himmelsdorf. However, its moderate top speed and traverse rate make it relatively vulnerable in the open. Tank destroyers are still a threat to you, especially at longer distances, and you're not a difficult target for artillery. The best way to defeat these enemies is to flank them, or roll with a group of teammates. It should be noted that the shape of the turret creates a shot trap around the turret ring, which makes the T-127 somewhat vulnerable to having its turret traverse mechanism damaged. When facing opponents of higher tiers, there is not much the T-127 can do other than shift to a support role. Picking off weaker enemies while hugging cover will ensure your survival in these matches. 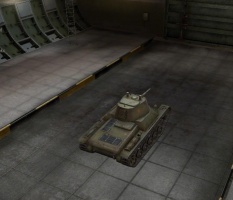 Circling your enemies is not advised because of the tank's relatively low traverse speed; only the slowest and heaviest of opponents might be vulnerable to this tactic. In short, if you use cover and flank your enemies, you can do a great deal of damage and live to tell the tale. After the Spanish civil war, Red Army leadership found T-26 tanks obsolete and ineffective, mostly due to their weak armor. 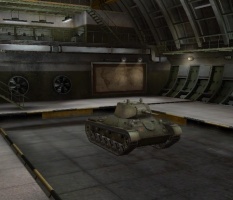 Therefore, the development of a new tank was ordered. Two military factories joined the competition, the Kirov Factory No. 100 and the OKMO design bureau in the Factory No. 185 (S.M. Kirov), both located in Leningrad (the factories are often mistaken for each other because of the very similar names). The project of the Factory No. 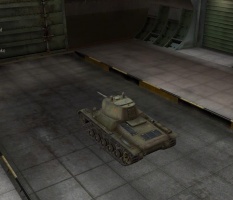 100 was known as "Object 211", some sources name it "T-50-2". OKMO in the Factory No. 185 created vehicle with a working title Object 126 or T-126 SP (SP - Soprovzhdeniya Pekhoty, ‘Infantry Support’) under the direction of S. Ginzburg and L. Troyanov in 1939. 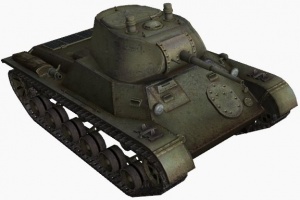 Slight modifications of T-126 SP led to creation of the T-127 tank, developed in 1940. Later modifications and improvements of T-127 evetually led to creation of the T-50 tank. T-126 at the Kubinka Tank Museum. Diese Seite wurde zuletzt am 25. Oktober 2016 um 14:24 Uhr geändert. Diese Seite wurde bisher 28 mal abgerufen.